The happy couple all wrapped up! My sister-in-law and her husband were celebrating their 50th wedding anniversary this past June 2008. I wanted to make them some "cozy" quilts to keep them warm in the winter in their northern Idaho home. They are both birders, but have been hiking and fishing in the mountains and streams of Idaho and Montana all their married lives. 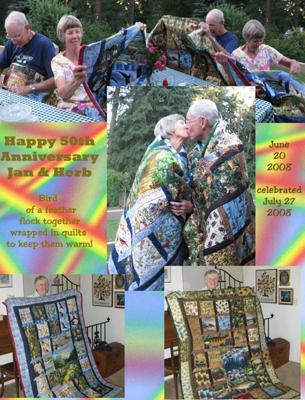 I wanted two quilts to portray their love of nature and "window-box" their hobbies. I made a birder quilt for my sister-in-law with a large garden scene as the center piece. Her husband ended up with deer, trout, elk and forests with a waterfall over rocks as his center scene. They were fun to make and fun to see so much enjoyed by the happy couple. I machine- quilted both and did very small stippling on the trout with metallic thread to give a shiny scale effect. Had never done any stippling before and was amazed at how easy it really was. What a great idea for quilts! !